Phat Wong is a fairly new Asian Cafe established by the same group that brought us Lolo Dad's Cafe in Malate and Lolo Dad's Brasserie in Makati. With that being said, expectations would really be set on high standards especially that the culinary team is composed of acclaimed Chef Ariel Manuel and Chef Marge Villena. A tandem that would take Asian dining to a whole new level of experience. The cozy interiors greet customers to a warm welcome and homey feel. Big round tables and longs tables mostly filled up the space in wooden floors with artistic paintings on the wall that creates a casual and warm vibe of serenity and relaxation. For our visit, we sampled Phat Wong Mother's Day Sharing Menu that is already good for 3 person. 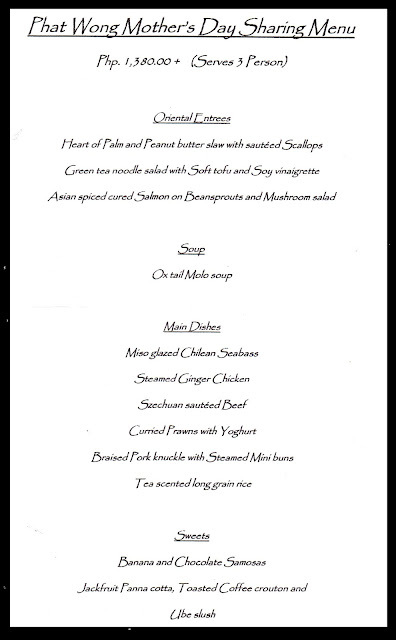 We were completely surprised on how affordable the set menu was given the list included in the menu. My favorite among the salad choices was this one as it was coated in sweet and creamy peanut butter dressing topped with generous amount of scallops. The crunchiness from the heart of palm slaw gave a much nuttier texture to the dish with bright and playful colors that appeals to the eye and palate. For a fresh and clean taste to start the meal, the Asian Spiced Cured Salmon on Beansprouts and Mushroom Salad is something to go for. The freshness of the salmon slices and beansprouts gave a light and natural taste that complements the earthy flavors from the mushrooms. A healthy salad of green tea soba topped with silky soft tofu and nori strips is one filling starter that gives a nice cold texture of soft noodles and tofu. The seaweed strips add saltiness and crunch to the plate that perfectly contrasted the smooth soba in light soy dressing. A light and heart warming bowl of ox tail molo soup is such a great twist to the classic molo. The ox tail in soft molo wrapper was very tasty and evident that would leave you wanting for more. A magical pot of steamed chicken in light ginger sauce and mixed with leeks and veggies to add much flavor to the dish.The chicken was chunky and tender with just the right amount of distinct ginger taste. Best to pair this dish with the Tea Scented Long Grain Rice as it perfectly complements each other. Albeit salty for our taste, the beef was tender, savory and juicy with bold and spicy flavors of Szechuan cuisine. Yes, the set includes sea bass on its menu. Incredible right? Having premium items at such very affordable price. The fish was tender and flaky with thick miso glaze on top that gave much of its flavor. I'd recommend scraping off a little amount of miso cause it gave a strong briny taste. Another pot of heart melting goodness is this dish of large prawns in thick, creamy and rich curry sauce that oozes with oriental flavor and spices. And to complete the set is this pork knuckle dish patatim style. It's great dipping the steamed mini buns into the sweet sauce even without the pork. The mini steamed buns had a siopao bun texture that was quite thick and dense. Though the pork knuckle was a bit chewy, the meat was very flavorful inside and out. To cap off our meal was this delicious and tempting plate of jackfruit panna cotta and banana chocolate samosas. The panna cotta had a sharp and distinct jacfruit taste with bits of jackfruit incorporated in it. Ube and jackfruit truly is a great combination as it complements each other perfectly. On the other hand, the samosa tasted more like turon only this had chocolate in it. Phat Wong's sharing menu would be available even after Mother's Day as they are planning to retain the set until May or even beyond that time. 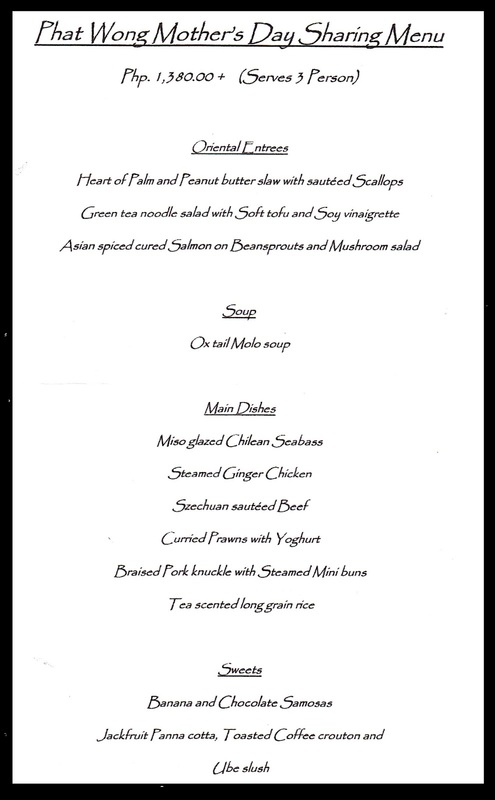 It is definitely a steal to avail of this set menu as it is complete with pork, beef, chicken, shrimp and fish dishes. What more could you ask for? One of Phat Wong's best seller is this Shrimp and Pomelo Salad stuffed inside a perfectly carved young coconut meat in coco kefir dressing. Ingredients used were fresh making this salad light, healthy and mouthwatering. We were told that there are even loyal customers who would order just this one every time they visit. Truly a must-try! Another must-try dish is their Hainanese Chicken which uses authentic yellow chicken that's much flavorful and savory. We promised to be back and try this on our next visit. Delicious and affordable meal! Love the plating talaga. wow i want to try this place! and the prices are reasonable. nice place, food looks so delicious.. great post! I'd love to try their Hainanese chicken! Looks sarap!! I love the cafe's interior! Another coffee shop.We have a lot of coffee shop already in the philippines and most of them are pricey .I don't know if the people are still dining in to theses fancy and overpriced resto and coffee shop. This is definitely a must try, food looks really good! wow... this is more than enough to put a smile in a mom's face, but the thought counts more. happy moms day to all. Yahweh bless. Such a nice place for a memorable dining experience. The food and ambiance are so welcoming.